Luvswesavory: Warm Scallops with Asparagus Fruity Salad & $500 Paypal CASH Giveaway! Warm Scallops with Asparagus Fruity Salad & $500 Paypal CASH Giveaway! Scallop is one of our favourite CNY home-cooked dishes as it sounds auspicious like (带带)'代代平安' "peace to every generation" in Mandarin and Cantonese. 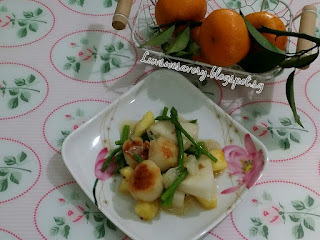 I usually make stir-fry scallops with asparagus for our CNY celebration dish. 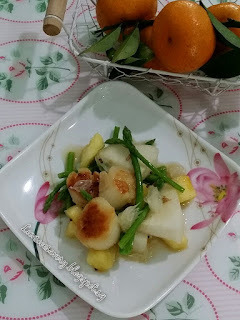 With my previous attempt in making warm salad here and Abalone Salad, so I tried out and 'agak-agak' guesstimate the taste and ingredients for this Warm Scallops with Asparagus Fruity Salad. Pomelo 柚 = 有 / 又 again & again ... thought to bring continuous prosperity. The more you eat, the more wealth it will bring. 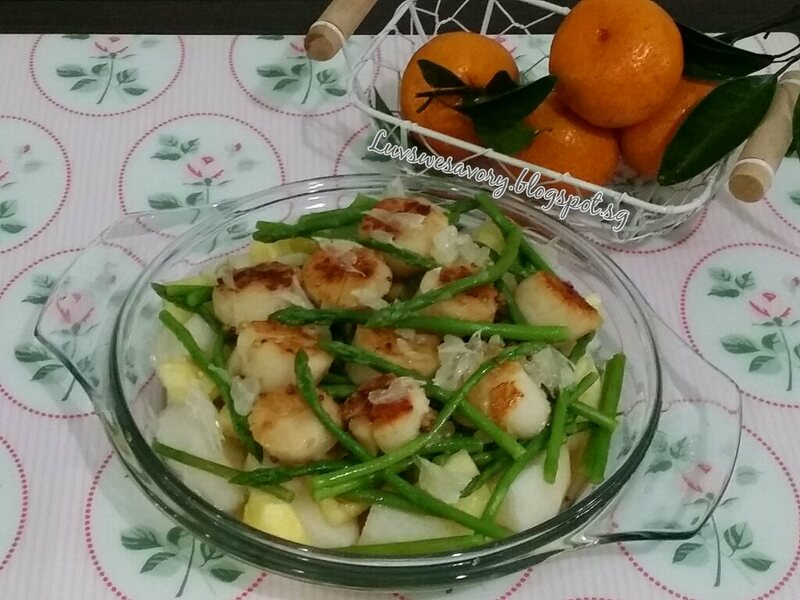 1) To save time, thaw the scallops (in steps 3 & 4) and prepare the salad dressing in advance. Put all the dressing ingredients in a screw-top jar and shake until well combined. Season with pinch of salt and dash of pepper. Chill for 1 - 2 hours. 2) Cut the fruits (pineapple and pear) in bite sizes. Chill the cut fruits in fridge. 3) Thaw the scallops. Rinse well and pat dry with few layers of kitchen towels. Do not cover, refrigerate the scallops for 30 minutes to dry. 4) Season the scallops with dash of salt and pepper to taste. 5) Saute non-stick pan over medium-high heat. Add olive oil to the pan. Add in the scallops, set in a single layer in the pan. Cook 2 to 3 minutes, until bottom of each scallop is nicely browned. Turn scallops over and cook for another 2 to 3 minutes until they're firm and nicely browned. 6) Wash, rinse and drain the asparagus in colander. Trim and discard about 1/2 inch of bottom stalk. Cut length wise about 2 inches long. 7) Meanwhile, prepare a small pot of boiling water and an ice bath (a bowl full of ice and water). Blanch the asparagus in boiling water for about 1 minute and quickly remove them from the boiling water and plunge them into the ice bath for about 15 seconds and drain. (this act is called “shocking”). Blanching and shocking allows the partially cooked vegetables to cool quickly so they retain their crunch. To serve the salad, arrange the cut fruits and asparagus on a big serving plate. 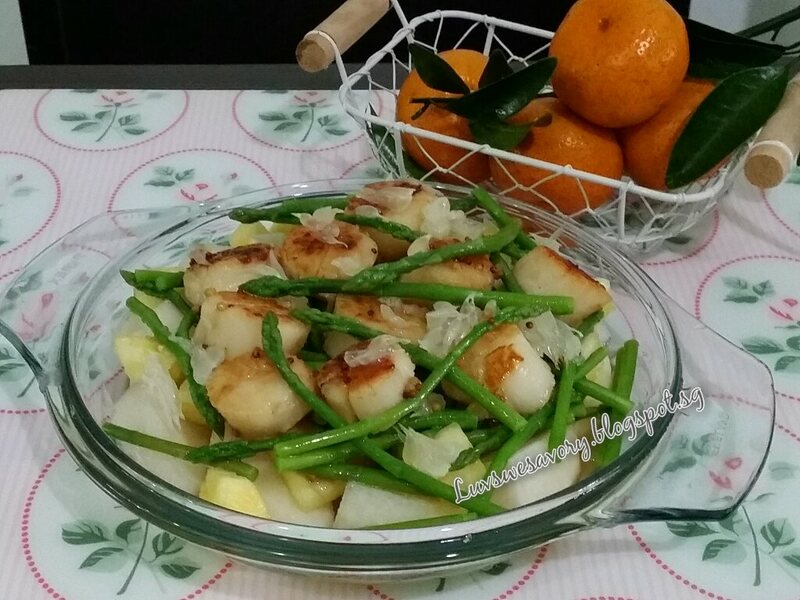 Top with the scallops and garnish with some pomelo. Pour the chilled lemon honey vinaigrette dressing and gently toss until just combined. Warm tangy salad with natural juicy fruity sweetness. My big kids gave big thumbs up for this :) Happy ^-^! I'm sure this salad will be well liked by everyone (from young to old) in the family. 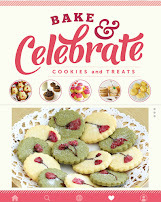 Do give it a try if you intend to dish up for CNY celebration. Counting down to CNY2016 ... here's a gentle reminder ... a chance to *win a S$500 Ang Pow as we usher into CNY2016 ^-^! This giveaway is opened to ALL International participants! Take part and maybe you will be the lucky winner ! 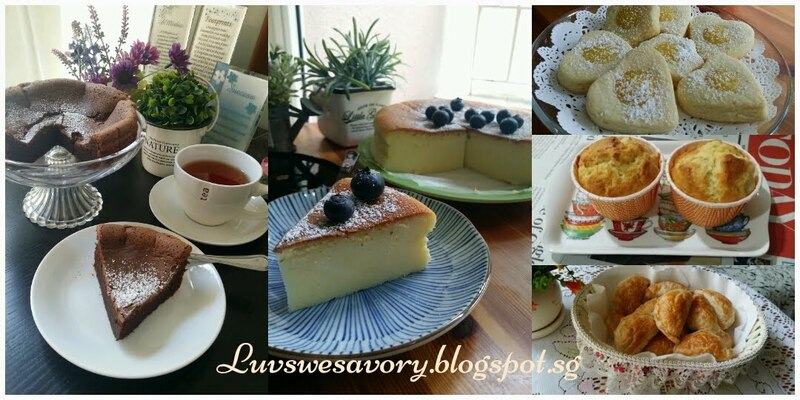 Closing on 3rd February ! Thanks and you too have a Blessed Lunar New Year! Hi Karen, love scallops and this looks like a wonderful meal. Hello Karen, its a delicious dish. 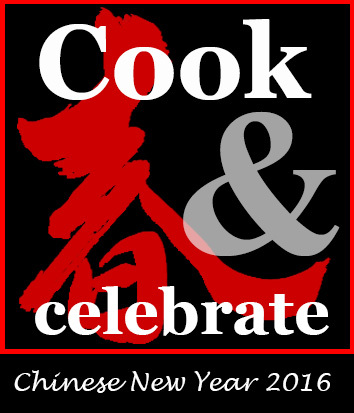 Wishing you and family a Happy and Blessed Chinese New Year 2016! Thanks Nancy and the same blessing to you too ^-^! this is yummy.. and very easy to cook.. I give it a BIG thumbs up too, Karen! Pineapples and Scallops are a favorite of mine anyway. Put them in a fruity salad with tangy dressing and I'm in heaven! Thank you so much for sharing, Karen...Happy New Year to You and Yours!!! You're welcome, Louise ! I'm with you love tangy dressing.